saved me grief and kept me from causing others grief. Dare to Lead is for everyone, not just professional leaders, because everything in this book applies to families and other groups. 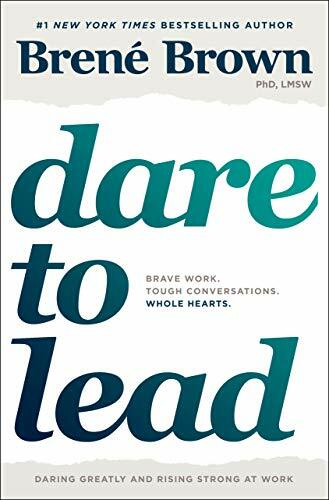 As Brené states, “I define a leader as anyone who takes responsibility for finding the potential in people and processes, and who has the courage to develop that potential.” In fact, Dare to Lead would be a wonderful resource or curriculum for a required high school class. There is SO much incredible insight, wisdom, and advice that my brain is tired, and it’s been havoc on my tear ducts multiple times. We all belong to groups, whether it’s at work, in social and community groups or clubs, etc., as members or leaders. And while this book is primarily aimed at leaders in the workplace, any group member would benefit from this knowledge and advice. Over the years, my groups have included my family of origin, my family from marriage, educational groups, event groups, competitive groups, etc. I have always been a good worker, boss, teacher, and leader of different groups. But “good” leaves a lot of leeway for the fact that a few times I have really screwed up in the very ways that Brené discusses. I look back and there were times that my perfectionism, my black-and-white rule-following, and my tendency to sometimes rush to judgement really hurt people. Not to mention, my shame affected my leadership. As I read Dare to Lead, I kept flashing to situations in my life and a couple of people I would really like to go back apologize to, one lady in particular. (Well, really, I want to travel back in time and not screw up to begin with, but sadly that’s just a fantasy.) A bit of background: I was raised in a very abusive family, physically and emotionally. My family of origin’s modus operandi was to judge, criticize, and belittle each member constantly. Mistakes and weaknesses were never forgiven, but held up, mocked, and laughed about over and over, on top of physical and emotional abuse. There was a time that my insecurity in running a large group led me to take a friend’s reported actions as betrayal. The resulting emotional backlash caused me to handle the situation so badly that I ended up being judgmental and majorly unkind to my friend to such a degree that the title “friend” no longer applies. I should have known better; I should have acted better. It wasn’t just that I hurt my reputation, interfered with how well the group was functioning, looked unprofessional to a hosting facility… The absolutely worst part was that I hurt another person – an innocent person. I broke every tenet I had set for my life because I didn’t take the time to step back and to be a good leader; I just reacted. I went right into shame and blame because I had such an inner fear of being disrespected and betrayed. As a consequence, I disrespected and betrayed my friend by treating her unkindly. In addition, I almost shut down a service that was helping over 1,000 families over the incident. I let fear rule my actions (“I don’t do vulnerability”) and cut my helpers loose (“I can go it alone”). I curtailed offerings and cancelled events. I had listened to and internalized comments from critics as they touched upon the worthlessness instilled by my parents and siblings. (Many people are eager to criticize, and it takes wisdom and practice to let go of unhelpful criticism and use the helpful input for growth.) My actions influenced some members to take sides in a group that shouldn’t have had “sides.” (“Increased polarization, rampant dehumanization of people who are different from us, and our growing inability to ditch the echo chambers for real critical thinking.”) After working alone for another year or so, I handed off the group to a team of ladies that I knew would do a better job than I was doing. I believe if I had read Dare to Lead first, I would have had the tools in place to respond appropriately in a way that would have fostered group cohesion, eliminated problems, and just generally been a better leader for my group. In addition, I ponder Brené’s adage that the “courage to be vulnerable is not about winning or losing, it’s about the courage to show up when you can’t predict or control the outcome.” I’ve considered going back and apologizing to my ex-friend many times, but I’ve always been afraid that it would simply set off more negativity. But it was my lack of judgement and responding with emotions from my past that caused the rift, and I’d like her to know that I take full responsibility for that. Is it too late to go back and tell this person how badly I feel about being a leader who truly mishandled the situation? Would it make a difference to her? I plan to reread this life-changing book with my husband and daughter, both IT professionals, so they can learn from it while I benefit from the review. Dare to Lead contains wisdom to guide leaders who want to nurture safe and effective work groups. It can also benefit leaders and members of any other groups or teams, whether for a sport, church, political group, competitive team, etc. I think Dare to Lead is also a great resource for members to use to kindly hold leaders accountable. There is no downside to taking this entire book in as heart knowledge and incorporating it into our lives. And the upside is that we will not only improve the quality of our own lives, but the lives of those we interact with. Highly recommended for the universe at large. This is the first book I’ve read by Brené Brown; I’ll definitely be reading more!